There is a curious cultural practice in the high-technology industry: the product demo. The product demo is a must-have ritual for any organization who has developed and will hopefully sell a technology product. But the demo is a fiction that harms the product’s design, and worse, limits the company’s innovative potential. The product demo is not a new phenomenon. Its roots can be traced back to our first interactions with technology in the 19th Century. Michael Faraday famously demonstrated the power of electricity at the Royal Institution in London, beginning in 1825, culminating in this famous lecture, “The Distinctive Properties of The Common Metals” in 1855. This particular lecture got some much needed star power with the attendance of the British Royal Family. Faraday’s lectures and others like them were designed to awe the audience. In the 19th Century, science and scientists were beginning to chip away at the religious world, and people like Faraday were there to pull back the curtain on God’s mysteries. The product demo has its roots in this concept of awe and triumph over the unknowable. By the end of the 19th Century, the inventor replaced the mere scientist as the hero of the times. Scientific discoveries alone were not celebrated, but the application of scientific knowledge. In other words, knowing about the natural world was no longer enough; controlling the natural world became far more important. The product demo became a demonstration not just of knowledge but of mastery. 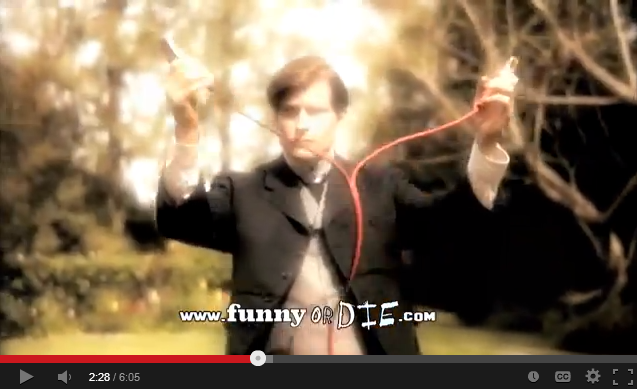 Drunk History nails the absurdity of these demos with their hilarious recounting of Edison and Tesla’s feud over electricity (a must-watch if you haven’t seen it). By this point, product demos changed. They were no longer lectures, but shows. The inventor was now expected to put on a show, complete with drama, climax and a “reveal.” The expectation of the demo is that there will be some moment (or perhaps many moments) that will surprise the audience. There will be a surprise and entertainment. Once a demo becomes a show, it has all the downsides of a show. There is a front stage and a back stage. The front stage is a construction that could fall apart in any moment. We learned recently just how constructed Steve Jobs’ initial iPhone product demo was. Among other problems, the cell signal bars had to be hard-coded because the signal was not reliable enough. The product demo is a show about the technology; it is not about the technology’s actual use at all. And this is the real problem with product demos: technology teams know full well they must put on a show. Instead of designing a much-needed solution, technology companies design “wow moments.” The Segway famously showed us that what tech nerds think is cool is painfully awkward for the rest of us to watch. Technology that may look good in product demos often has no place in everyday life. For technology to really help us live better lives, it must fit into our everyday routines. It must alleviate burdensome experiences. It must improve our abilities in pleasant, non-distracting ways. The “calm technology” disappears when we don’t need it, and re-appears when we summon it. This is the direct opposite of demo technology, which is inherently dramatic, attention-getting, and the “star” of the show. Collectively, we tend to focus — wrongly — on “breakthrough” technologies, such as the proverbial flying car. What we need now in this stage of our technological development is filling the gaps in our fragmented technological ecosystem. We do not need a flying car; we need better existing cars. We do not need a Holodeck; we need less email. The next time you witness a product demo, imagine it is for a fix to your biggest technology frustration. Imagine it is a tool or practice to reduce email volume. Would this be an amazing show? No. Would there be a dramatic unveiling? No. But this innovation would solve many of our daily frustrations and greatly improve our overall quality of life. Unfortunately, the product demo is a practice that privileges breakthrough technologies. It is an expectation for startups to attract capital and user interest. It’s almost impossible to create an incremental innovative technology in this format. Imagine technology companies never did product demos. Startups would no longer be expected to create “shows” to attract funding. There would be no reason to have a “wow feature” that would make the audience gasp. The technology’s value would not be revealed in a moment, but come to be known through use over time. Imagine when after several weeks or months, the user base would grow and the value of the technology would be appreciated gradually. The Hype Cycle might disappear forever. But most importantly, we may open the way for technology designers to finally solve real, everyday problems, instead of focusing on making a big splash. Breakthrough technologies would still capture the popular imagination, but the technology industry would have more room for the mundane, somewhat boring technology that might very much improve our lives.